Multiple Ducks Drafted in the First Round? 2014 was a historic year for the Oregon football team. The Ducks finished the season with 13 wins, a Rose Bowl victory and a berth in the inaugural College Football Playoff National Championship Game. Now it appears the success might transfer to the next level, too. We know the NFL Draft has its surprises, but could we see multiple Ducks drafted in the first round? Currently, Oregon has a lock for the first round in quarterback Marcus Mariota. It is extremely unlikely that he’ll even fall out of the Top 10. In fact, Mariota could become the highest Duck drafted in the modern era if he goes either first or second overall. Akili Smith, Joey Harrington and Dion Jordan all went third overall. With his performance at the combine, Mariota should be a lock for a Top 10 pick (and possibly the top overall pick) in 2015. 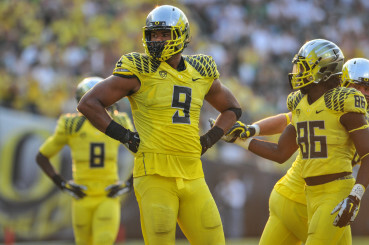 Arik Armstead (9) could be a first-round draft pick. With Mariota off the board in Round 1, who might join him? Well, according to ESPN’s Todd McShay’s mock draft from February 5, Arik Armstead could be in the Top 10 range as well. Armstead has the size that NFL teams love and has nothing but technical upside. As a run stopping 3-4 defensive end at the NFL level, he should be able to play all three downs which gives him added value. Some team in the first round will likely fall in love with his size and upside and believe its coaching staff can improve his technique and strength. There are several teams slated early in the draft who need defensive lineman help. The Chicago Bears, Atlanta Falcons and New York Giants all need to improve their defense and pick No. 7, No. 8 and No. 9 respectively. If Armstead has a solid pro day after his good showing at the NFL Combine, we might see two top-10 Ducks for the first time in history. While I’m personally still unsure if he is a Top 10 talent, I would be surprised if Armstead fell completely out of the first round. 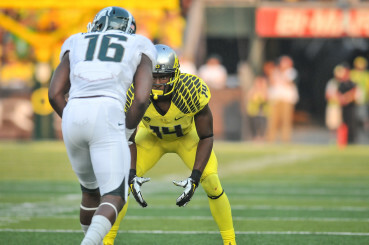 Ifo Ekpre-Olomu (14) defends an MSU player. So with two Oregon players now possibly drafted in the first round, are there any other Ducks who could also earn that honor? At the beginning of the season, it seemed that standout CB Ifo Ekpre-Olomu would be the top corner in the draft. However, that was then and times have changed. Ekpre-Olomu is currently still rehabbing his injured knee, so he was unable to participate in the combine workouts. Even with the injury, he is still a Top 5 corner heading into the draft, which puts him somewhere in the late first or early second round status. If he is healthy enough for his pro day, he could jump back onto the first round radar with solid individual drills and a good 40-yard dash. 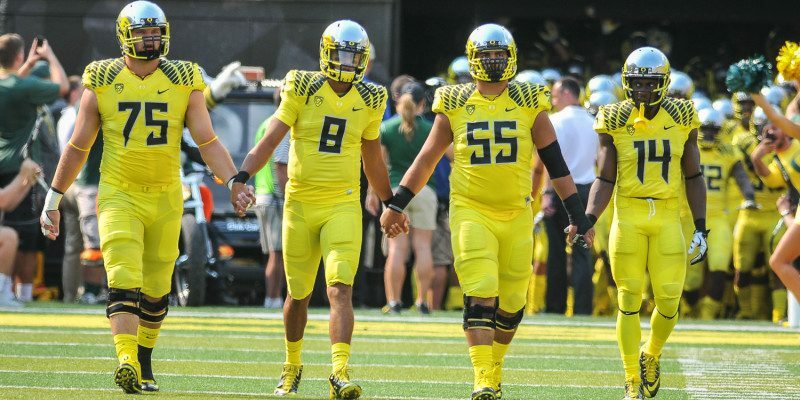 Oregon will definitely have one first-round pick in 2015 — we all know that — but we could possibly see three Ducks go on the first night. If that happens, that would be the most Ducks taken in the first round ever — besting the 2013 draft when Jordan and Long both went in the first round. I’m a fan of the NFL Draft and watch it every year, but the thought of three Ducks going in the first round has me even more excited. Go Ducks!